The fisherman parked illegally at the platform for the disabled. Mr Harney’s friend has health problems and they opted for the Port Bouvard Marina because the parking bays are close to the fishing platform. But when they arrived, a station wagon was parked on one of the platforms designated for seniors/disabled. “The person was there for at least four hours, sitting on the tailgate of the vehicle, smoking and drinking while watching his rod in the rod holder,’’ Mr Harney claimed. Mr Harney was concerned the vehicle was preventing anyone else using the platform that was designed for seniors/disabled only and blocking the footpath. He said he complained to the City of Mandurah but received no response. And that is where it became complicated. 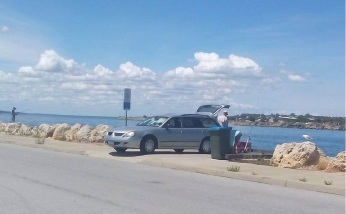 A City of Mandurah spokesman said footpaths were designed for use by pedestrians, prams, bicycles, wheelchairs and gophers only and parking was prohibited. But the council believed the marina was the responsibility of the Department of Transport. Not according to the Department of Transport which claimed footpaths and fishing platforms were the responsibility of the council and the department had only to deal with issues with the revetment wall. All Mr Harney wants to know is if parking on the fishing platform is legal and what action the council will take. He just wants the council to admit it’s their responsibility and that a ranger should have responded to his complaint.